Ms. Fatoumata Diallo was a Junior Research Fellow at ISDP’s Stockholm China Center in 2018. She recently obtained a Master’s in International Relations at Leiden University, the Netherlands and holds a Bachelor’s Degree in International Relations and Chinese Studies from the INALCO, Paris. Her topics of focus included, China’s foreign policy, non-traditional security, China’s political economy and sociology. 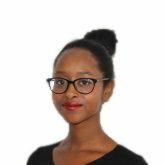 Ms. Diallo has prior work experience in this field having taken an internship at Club Efficience, a French think tank specialized in the development of business synergies between African and French companies. She conducted an internship at ISDP’s Stockholm China Center from February-June 2018, where she focused on issues of security and development pertaining to China-Africa relations. Private Security Companies: The New Notch in Beijing’s Belt and Road Initiative? China’s Ivory Trade Ban: A Silver Lining for the African Elephant?